As you're probably aware, chipmakers are starting to struggle with silicon these days in terms of making better-performing CPUs built on ever-smaller processes – which is why they're looking at alternatives to silicon such as carbon nanotubes, a field which has just witnessed an important breakthrough. The advance has been made by scientists at the University of Wisconsin-Madison, who say they've been able to produce carbon nanotube transistors which outperform today's silicon transistors considerably, enabling a current that's 1.9 times higher than that seen with silicon. 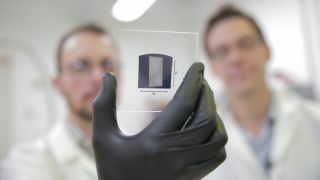 The researchers have made important leaps forward in terms of properly aligning the nanotubes on a wafer, and ensuring their purity – saying that eliminating metallic impurities is crucial because these can disrupt the semiconducting properties of the nanotubes (causing something akin to a short in electronics). One of the project leads, Michael Arnold, noted: "We've identified specific conditions in which you can get rid of nearly all metallic nanotubes, where we have less than 0.01% metallic nanotubes." Theoretically, carbon nanotube transistors should be able to outperform silicon to the tune of being five times faster, or to use five times less energy when it comes to devices which will benefit from efficiency more than speed. The upshot could be beefier processors in the future, faster wireless communications and improved battery life for portable devices. Arnold commented: "Making carbon nanotube transistors that are better than silicon transistors is a big milestone. This breakthrough in carbon nanotube transistor performance is a critical advance toward exploiting carbon nanotubes in logic, high-speed communications, and other semiconductor electronics technologies." Of course, as ever, there's still work to be done and the team at UW-Madison still need to scale this process up to the level of commercial production. As we noted in our recent feature on future processor tech, IBM reckons that we may see carbon nanotube CPUs before the end of this decade. And because carbon nanotubes are flexible, they could have applications in all sorts of flexible and stretchable electronics. And on the memory front, Fujitsu recently announced that carbon nanotube-based NRAM will be arriving in 2018, if current plans stay on track. All in all, we should be set for some exciting advances in computing over the next few years.